Overexpression of IL-27 upregulates expression of multiple IR by T cells in vivo. (A–C) Mice were treated with IL-27 minicircles, and then splenocytes were analyzed by microarray. (A) Volcano plot showing cutoff of genes modulated by log2 fold change >1.0. Genes of interest are highlighted in red. (B) Expression of select immunomodulatory genes. (C) Mice were treated with IL-27 minicircles and IR expression by CD4+ and CD8+ T cells from spleens, and PBMC was assessed by flow cytometry. Three mice per group. Error bars indicate SEM. Statistical significance was determined by using Student t test. ns; p > 0.05, *p < 0.05, **p < 0.01, ***p < 0.001. 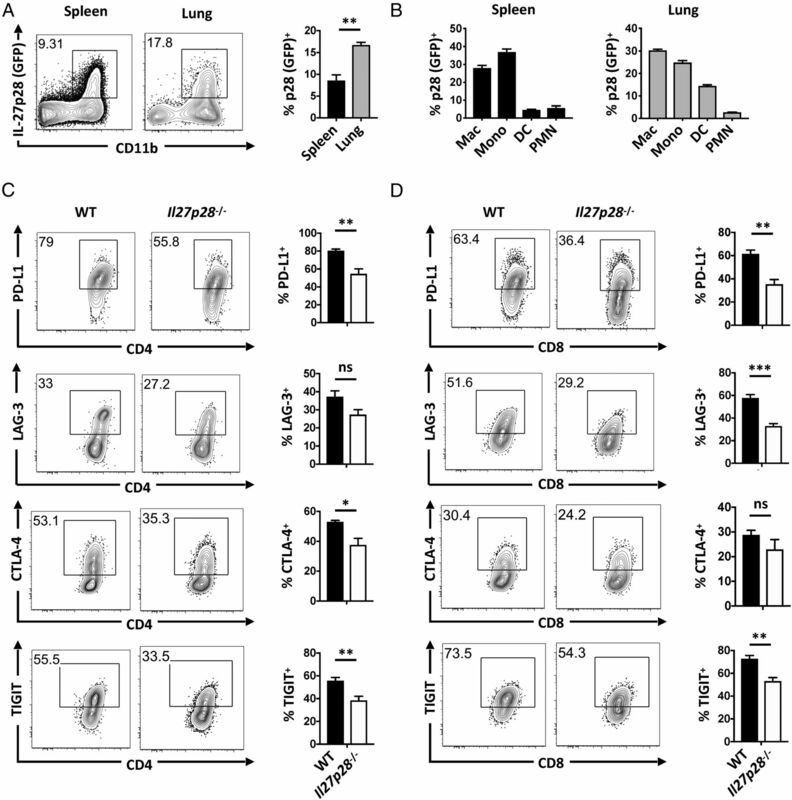 IL-27 induces expression of multiple IR by CD4+ T cells. Naive Ly6C–Sca-1– CD4+ and T cells were sort purified and cultured in the presence or absence of α-CD3/28, in the presence or absence of IL-27. After an 85-h culture, cells were analyzed for expression of PD-L1, PD-1, LAG-3, and CTLA-4. Representative FACS plots (left). Bar charts (right) show combined results from four independent experiments. Error bars indicate SEM. Statistical significance was determined by using Student t test. ns; p > 0.05, *p < 0.05, **p < 0.01, ***p < 0.001. 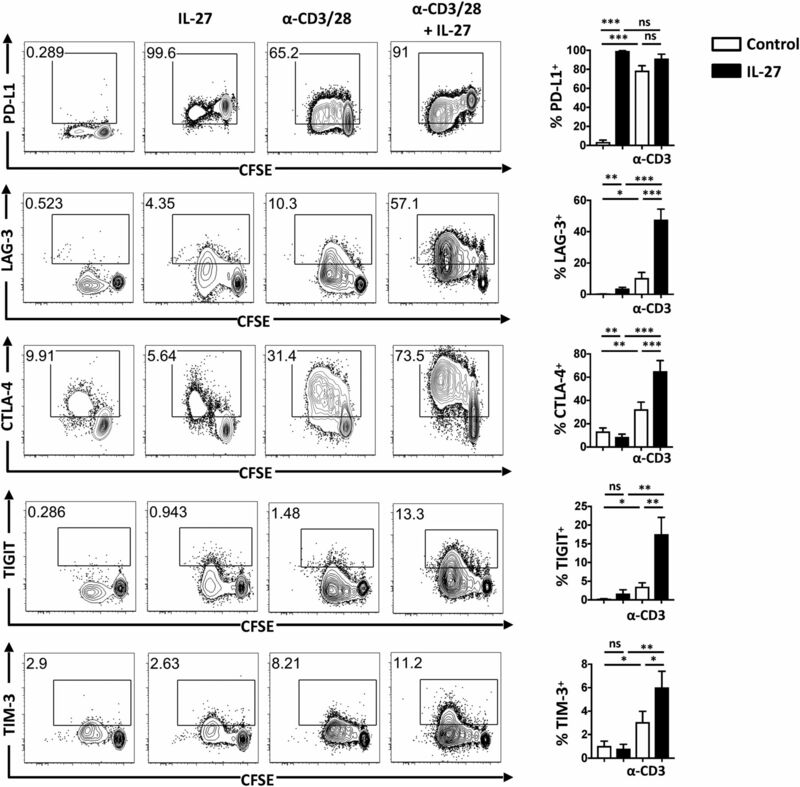 IL-27 induces expression of multiple IR by CD8+ T cells. 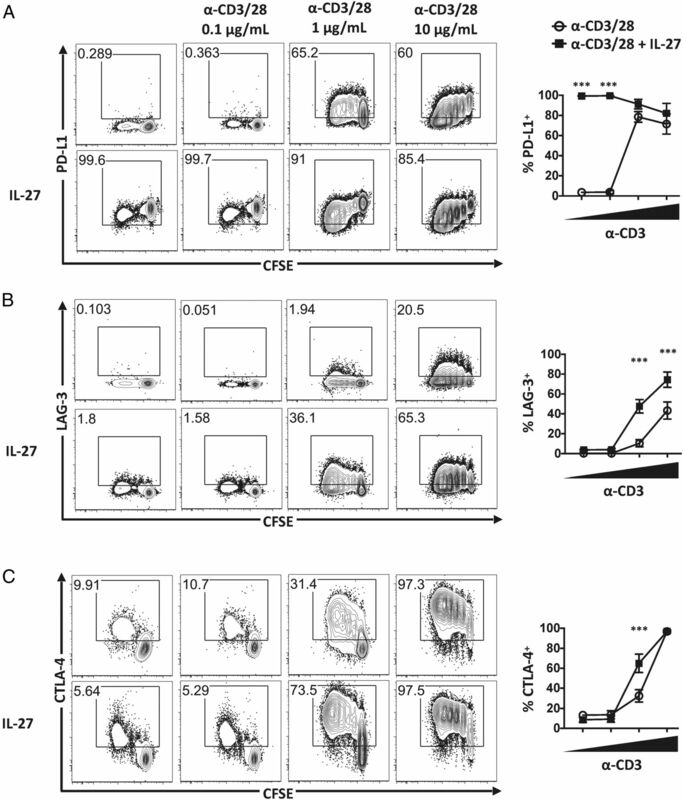 Naive, Ly6C–Sca-1– CD8+ and T cells were sort purified and cultured in the presence or absence of α-CD3/28, in the presence or absence of IL-27. After an 85-h culture, cells were analyzed for expression of PD-L1, PD-1, LAG-3, and CTLA-4. Representative FACS plots (left). Bar charts (right) show combined results from four independent experiments. Error bars indicate SEM. Statistical significance was determined by using Student t test. ns; p > 0.05, *p < 0.05, **p < 0.01, ***p < 0.001. Role of IL-27 in expression of PD-L1, LAG-3, and CTLA-4 depends on strength of α-CD3/28 signaling. 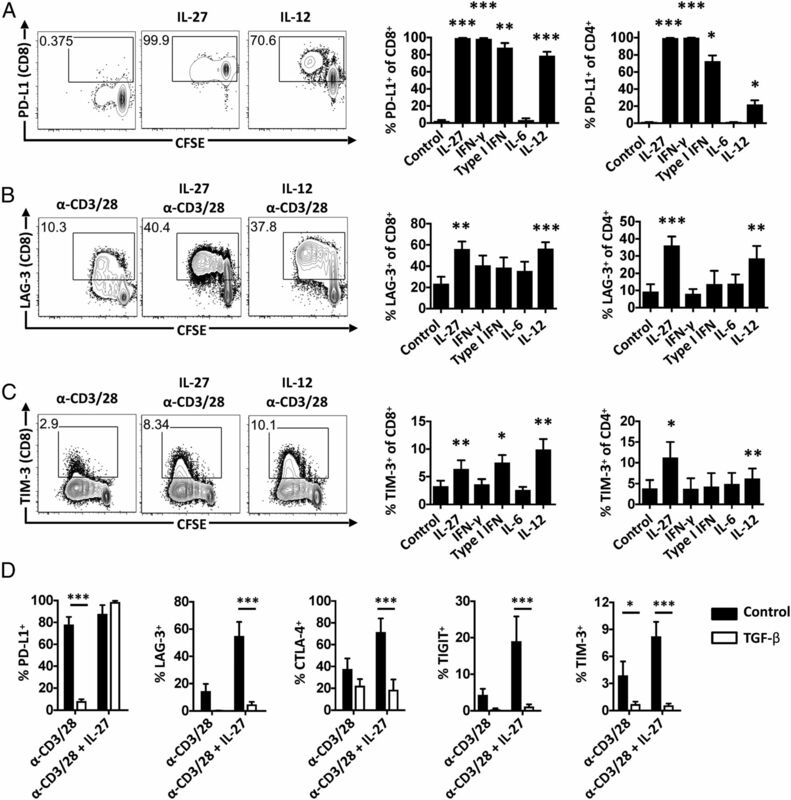 Naive Ly6C– Sca-1– CD8+ T cells were sorted and cultured in the absence of α-CD3/CD28 or stimulated with 0, 0.1, 1, or 10 μg/ml plate-bound α-CD3 and 1 μg/ml soluble α-CD28 for 84 h. Cells were assessed for expression of PD-L1 (A), LAG-3 (B), and CTLA-4 (C). Representative flow plots (left). Graphs display the results of three to five independent experiments (right). Error bars indicate SEM. Statistical significance of differences between IL-27–treated and non–IL-27–treated cells was determined using a paired Student t test. *p < 0.05, **p < 0.01, ***p < 0.001. Modulation of IR by multiple cytokines. (A) Sorted naive CD4+ and CD8+ T cells were cultured with the indicated cytokines and assessed for expression of PD-L1. (B and C) Sorted naive CD4+ and CD8+ T cells were cultured with anti-CD3/28 stimulation and the indicated cytokines and were assessed for expression of LAG-3 (B) and TIM-3 (C). Representative flow plots for control, IL-27, and IL-12 conditions (left). Summary bar charts (right). 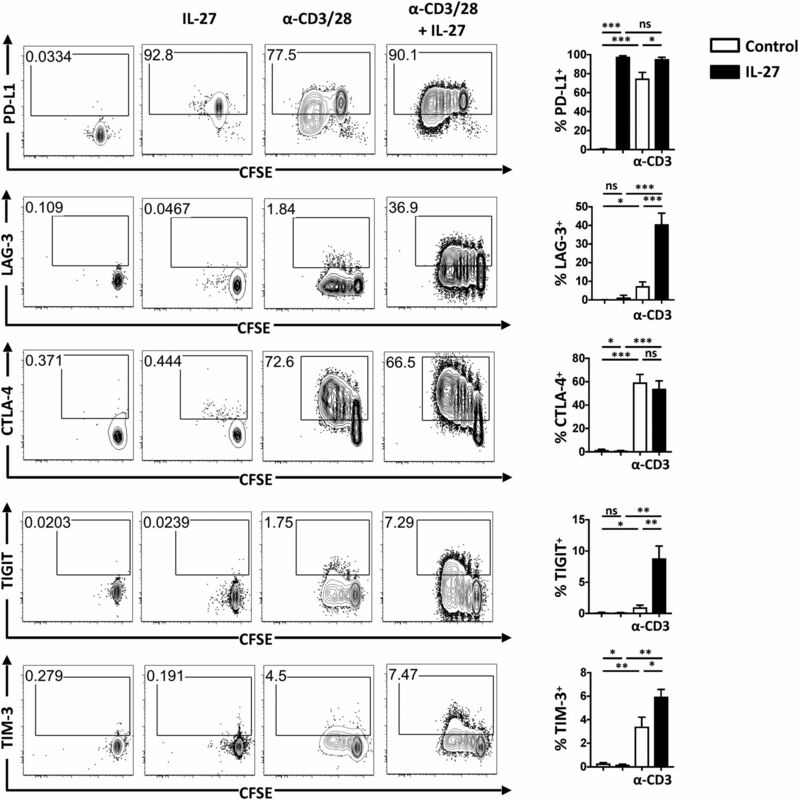 (D) TGF-β inhibits IL-27–mediated IR expression in naive CD8+ T cells. Bar charts summarize results of two to four independent experiments. Error bars indicate SEM. Statistical significance of cytokine versus control determined by paired Student t test. ns; p > 0.05, *p < 0.05, **p < 0.01, ***p < 0.001. IR expression is upregulated during toxoplasmosis. (A and B) IR expression by splenic CD4+ (A) and CD8+ (B) T cells in naive mice (gated LFA-1lo) or at day 10 of infection (gated LFA-1hi tetramer+). Representative flow plots (left) and bar charts (right) showing pooled data from four to six independent experiments, one mouse per experiment. Error bars indicate SEM. *p < 0.05, **p < 0.01, ***p < 0.001. 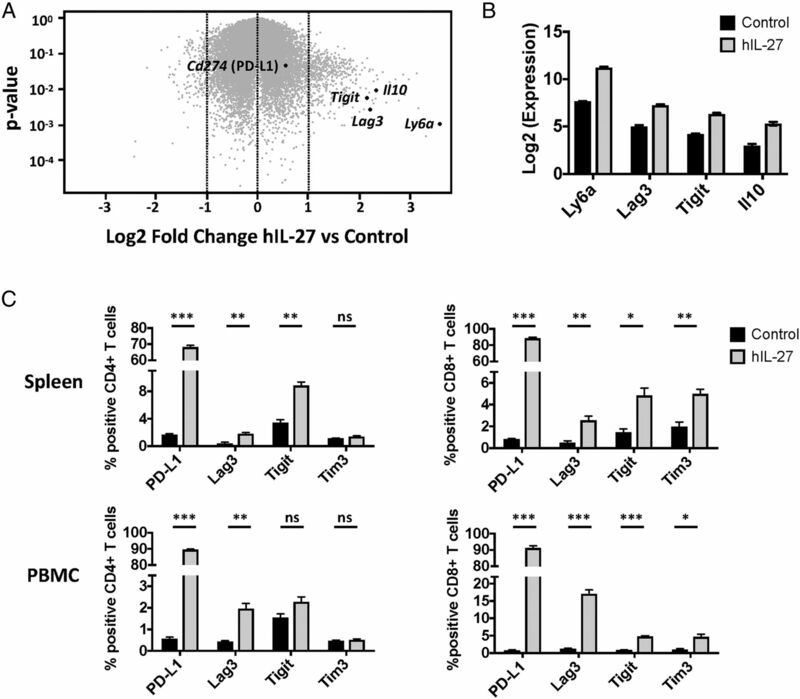 IL-27 contributes to IR expression by lung T cells during toxoplasmosis. (A) Il27p28-GFP reporter mice were infected with 20 Me49 cysts i.p. for 10 d. p28-GFP was examined on nonlymphocytes (CD3−NK1.1−B220−CD19−) within the spleen (black bars) and lung (gray bars). (B) Within nonlymphocytes, p28-GFP expression was examined in macrophages (CD11b+CD64+Ly6GloF4/80+Ly6Clo), monocytes (CD11b+CD64+Ly6GloLy6Chi), DC (CD64−CD11c+MHCII+), and polymorphonuclear cells (CD11b+CD11c−CD64−Ly6cintLy6G+) in the spleen (left) and lung (right). (C and D) WT and Il27p28−/− mice were infected with 20 Me49 cysts i.p. 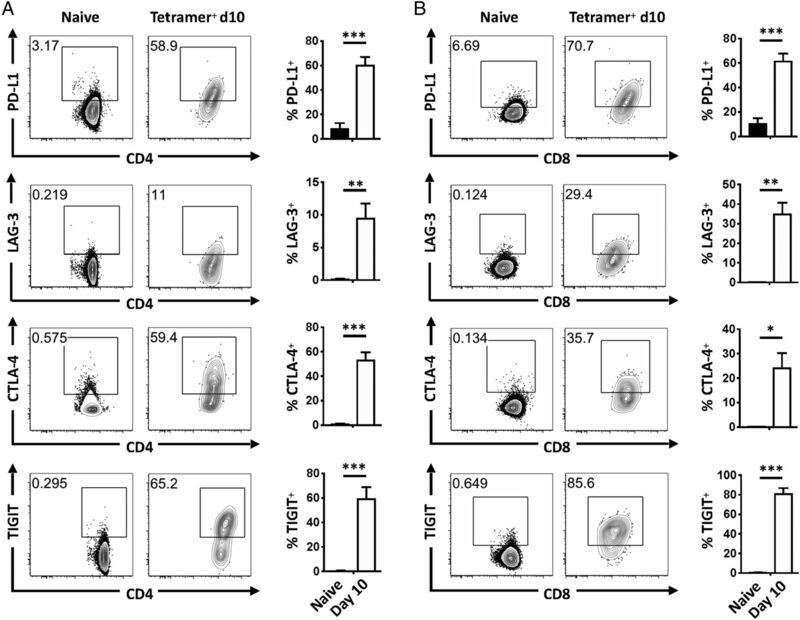 for 11–12 d. IR expression by WT (black bars) and Il27p28−/− (white bars) lung tetramer+ CD4+ (B) and CD8+ (C) T cells. Three to five mice per group. Data representative of one (A) or four (B and C) independent experiments. Error bars indicate SEM. *p < 0.05, **p < 0.01, ***p < 0.001.